Body Contouring after Weight Loss. (This 60 year old patient lost 120 pounds!) These before & after photos were taken 3 months apart. The horizontal lines and redness you see across her tummy (under her belly button) is from her undergarments pressing on her skin. As most of you know, Body Contouring After Weight Loss is a big part of my cosmetic practice. Losing weight (at any age) is a lot of work! Sometimes, after all that hard work to lose the weight, we are left with unwanted side effects such as hanging skin and stretchmarks. That’s where Body Contouring After Weight Loss comes in. After losing a significant amount of weight (120 pounds), this 60 year old patient was left with excess sagging skin and stretchmarks on her abdomen. Her excess skin and stretchmarks were making her feel uncomfortable, her clothing wasn’t sitting right, and she wanted to treat herself for losing all that weight so she decided to book a consult to learn more about her options. During her initial consultation, we discussed her aesthetic goals and surgical options in detail. Together, we decided on a special type of tummy tuck commonly used for weight loss patients. This type of tummy tuck is called a “fleur-de-lys” which allows removal of excess skin in all directions (vertically and horizontally). This type of tummy tuck results in a standard extended tummy tuck incision line (low under the underwear line) and a vertical incision line. Her incision lines will continue to fade and will be less noticeable overtime. What Other Procedures Are Commonly Done At The Same Time As Body Contouring After Weight Loss? Body Contouring after weight loss is often combined with Breast Lift, Arm Lift, Breast Augmentation, and Liposuction. If you are interested in Body Contouring, Breast Surgery, or Facial Cosmetics (Dermal Fillers, Botox, Laser Treatments, etc.) call 204.813.0305. You can see more detailed information about your surgical options on our Tummy Tuck page and our Arm Lift + Thigh Lift page. 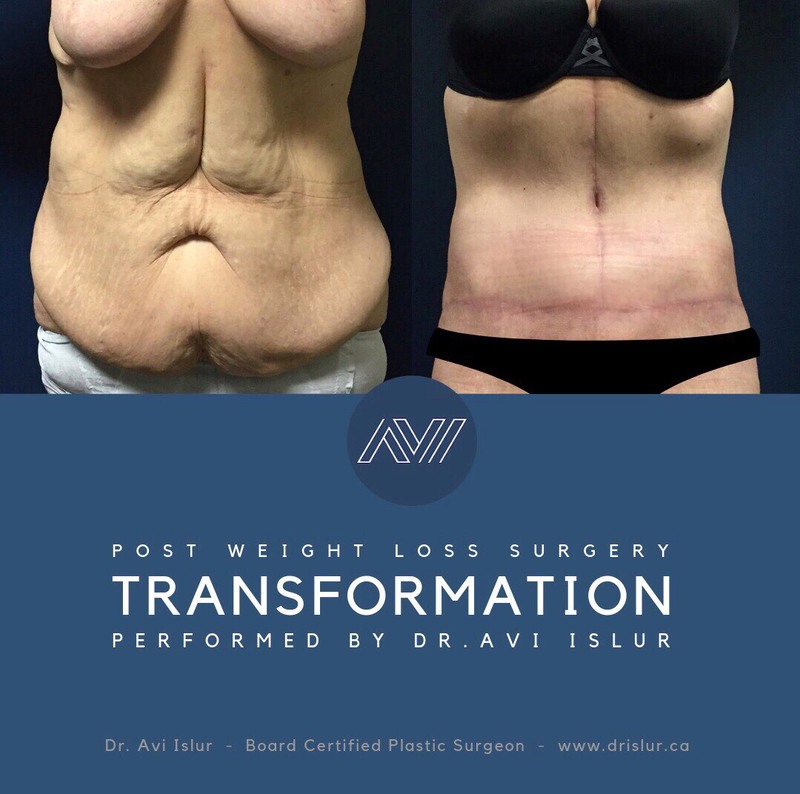 If you’d like to come in to see Dr. Avi Islur so he can help you determine which procedure is best for your body contouring surgery, you can call one of Dr. Avi Islur’s Patient Coordinators at (204) 813-0305 , we’re happy to help you!